Brandon Sanderson is one of those authors I’ve always wanted to read but at the same time I look at his books and go, “Man those are long.” So I’m happy to say Skyward (was long) but totally fun and fast and I will definitely be picking up more of his work. The aliens have arrived and attack us in a series of waves including taking the power, spreading disease, and mass destruction without ever being seen. The 5th Wave based on the book by Rick Yancey (that I very much enjoyed) tells the story of Cassie, a teenage survivor desperately trying to reunite with her brother Sam. As well as the children with Sam co-opted by the military to fight the invaders for the next wave. Like I said I really enjoyed the book but the movie was… average. It starts out pretty well in a lot of ways. The CGI isn’t bad. The alien attacks are horrible because they leave the humans with absolutely no ability to fight back. Chloe Moretz does a good job as Cassie and Liev Schreiber is really good as Vosch, the head military man. There were a couple of good emotional moments thrown in as well like when she can’t catch up to Sam as he’s taken away. I also thought the movie did a fairly good job of not telegraphing the twists- spoilers for which I won’t give away. It’s really the second part of the movie where it fell apart for me. I liked Evan in the books but it seemed like all the meat from his relationship with Cassie (and his character) was gone. There was very little there from the time he appeared and it felt boring. I hate to say it to but Alex Roe (Evan) was not that good. Maybe it wasn’t him because they stripped a lot from Ben (Cassie’s former crush and current military recruit) as well but I thought that actor still did a good job. Seriously, there’s a scene where she watches Evan bathing in a river and it just felt odd because there was nothing behind that relationship to me. It didn’t do much to help Cassie’s characterization either. Lastly, and this could be nitpicking, I don’t remember if all the stuff on the military base was as unbelievable in the book as it was in the movie. It all felt way, way to easy for the heroes. I don’t think it’s a spoiler to say that at one point Cassie is rushing through a crowd, wearing a completely different uniform and making a scene while in wide shots you can see guards on the outside of the crowd and no one seems to see her or stop her. I gave the movie bonus points for a scene where Cassie is scavenging and grabs some tampons because hey, even in an alien invasion you still need the necessities. But then again a friend pointed out how she always seemed to have killer hair products and seriously, even after she had been injured her hair was still on point. So maybe that’s a wash.
Long term reading goal: Finish at least some of the series I’ve started. Yep, that’s been a goal for a long time! There’s just so many series. 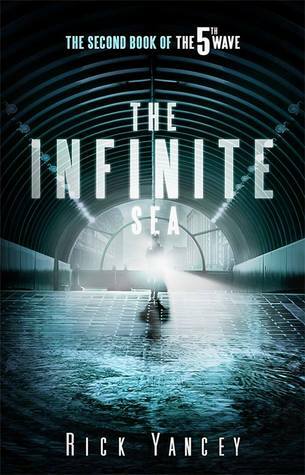 But this book is the sequel to The Fifth Wave (see movie trailer here) The story continues of Cassie and her little brother and the other teenage soldiers they sprung at the end of the first book continues even though all hope definitely seems lost. They are holed up in an abandon hotel so Cassie can wait for Evan who may or may not be dead but either way he’s a turned alien so everyone else isn’t exactly thrilled to death at their love or happy to be waiting around for him. This book was a typical sequel which is why I stuck it at an average C. There’s a lot going on but somehow at the end not much had happened. Ringer is a huge part of this book and that’s okay I like the character but she’s probably fifty percent of the book alone so if you’re in it for Cassie and Evan that might be a problem. Everything is set up. Give credit where it’s due there are some answers provided and I’m definitely going to read the third book. But I’ll tell you (without giving away any spoilers) there is one part with Cassie where she does something so dumb and does get people killed that it bothered me for the rest of the book and I don’t know if there’s any going back with that character for me. Unfortunately because I did like her in the beginning. Recommend: I was going to say yes but instead I reserve the right to judgement until I finish the series. Hopefully by putting this in writing I actually will!